The property is situated within a private wooded valley just off the only road through Little Haven. It boasts one of the most secluded locations in the area yet retains easy access to all of the village amenities. 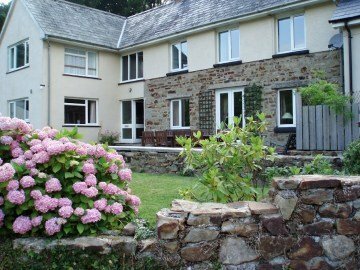 Howelston Mill Cottage is a spacious family home situated within Pembrokeshire Coast National Park and has been renovated in keeping with the surrounding area. The cottage is now of an exceptional standard, providing everything you require to make your stay in Little Haven as pleasurable as possible. Laundry room off kitchen with washing machine, tumble drier, ironing board and iron. A spacious lounge with plenty of comfy seating, dominated by an old fireplace which incorporates a wood burning stove. A Flat screen TV, DVD player and Hi-Fi is provided. French doors open onto the patio area. A separate family room with a comfy sofa, Flat screen TV and DVD player, jigsaws, games and puzzles. A bathroom with Bath, walk in shower, wash-hand basin, and W.C.
A large patio area and moderate private lawn at the front of the cottage. Patio table, eight chairs and a barbeque. Private parking for three cars only. Oil fired central heating and hot water is included in your weeks stay. Logs and coal are available for the wood burner on advance request. High chair, cot and stair gate are available on advance request. Please note that we operate a No Smoking policy and do not allow pets. A damage deposit of £150 is required.